This article is about the focal point of the Golden Triangle at the intersection of the three countries; for the wider region in Thailand, see Chiang Rai Province. The Golden Triangle (สามเหลี่ยมทองคำ Saam Liam Thong Kham) is in Chiang Rai Province, in the far north of Thailand. The English name comes from the meeting of Laos, Myanmar and Thailand here, but to the locals it's Sop Ruak, since this is where the Mekong meets the Ruak River. Historically the Golden Triangle has been an area well-known for the growing of opium, and the name comes from a US State Department memo on the practice. These days, though, the place lives on the cultivation of tourists, and this is undoubtedly the largest tourist trap in northern Thailand. The landscape is hilly, divided by the Ruak River that flows into the Mekong (Mae Khong) River. These rivers form a natural boundary between the three countries Laos (to the east of the Mekong), Myanmar (to the north of the Ruak), and Thailand (to the west of the Mae Khong). The confluence of the Mekong and the Ruak in the dry season: the foreground is Thailand, the sandbar is Myanmar and the opposite bank is Laos. Most people seem to come here on guided bus tours. For independent travellers, blue songthaews run through the Golden Triangle from Mae Sai (45 min, 50 baht) to Chiang Saen (15 min, 20 baht) and back again every 20 minutes or so 08:00 - 12:00. Greenbus minivans run from Chiang Rai Bus Terminal (50B) to Mae Chan, Chiang Saen and Golden Triangle (early morning - 17:00). At The Golden Triangle the Greenbus minivan bus stop is in front of the restaurant which is next to the entry road of the parking lot behind the Big Buddha statue (diagonally opposite Wat gate). There may be traffic guards at the road entrance who can show you where the stop is (it is not marked). It runs every 30-60 minutes (trip can take up to 2 hours to Chiang Rai). If you miss the last songthaew/bus, you will be at the mercy of the tuk-tuk and motorcycle taxi drivers that will charge around 70 baht for the 10km trip from the Golden Triangle to Chiang Saen. Check the tourist information booth for the latest information (it is located approx 100m NNW of Big Buddha statue [towards Mae Sai]). Boats can be hired to view scenery around the golden triangle from Sop Ruak along the Mekong River to Chiang Saen and Chiang Khong which takes around 40 minutes and one and a half hours respectively. The main area is the Thai riverside near the point where the rivers meet, which — in the dry season, when the Mekong runs low — is even marked by a handy sandbar. This in itself is pretty anticlimactic, so a series of increasingly bizarre attractions have been erected by the riverside to make up for it: there's a giant golden Buddha on a ship, elephant statues where you can clamber to pose atop a palanquin (in exchange for a donation, of course), elaborate shrines to the royal family, half a dozen signs stating that yes, this really is the Golden Triangle and, inevitably, river cruise touts, souvenir shops and Western-style cafes. 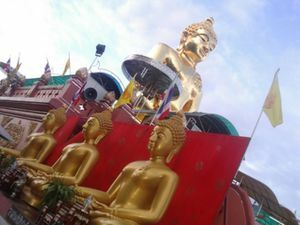 Phra That Doi Pu Khao (พระธาตุดอยปูเข้า) is located on the hill just before the Golden Triangle and believed to have been built by a king of Wiang Hirannakhon Ngoen Yang in mid-8th century. Remains of antiquities are in the Viharn with crumbled Chedis. Take a photo at the gate marking the Golden Triangle. Go on a boat ride across to a small island named Don Sao, belonging to Laos. No visa for Laos is required to make this trip. This is popular among tourists, and many small boats offer this service. The island is in Laos, and should you be so inclined you could claim to have visited the country, although you are not allowed to enter into the rest of Laos from there without a visa. There are a number of scruffy bamboo-built cafes as you come in from the north, and then a chain of largely identical-looking cafes and restaurants along the riverside promenade. A sprawl of guesthouses and hotels has popped up on the Thai side of the river. However, better accommodations can be found in Chiang Saen, Chiang Khong and Chiang Rai, and most visitors choose to visit as a day-trip. South to the historical city of Chiang Saen. Southeast to Laos via Chiang Khong. By bus, rental car or taxi to Chiang Rai. This page was last edited on 24 March 2019, at 18:32.